Technical Associates was located at 3730 San Fernando Road, in Glendale, California in 1948. It later moved to 140 West Providencia Avenue in Burbank, California in 1953. 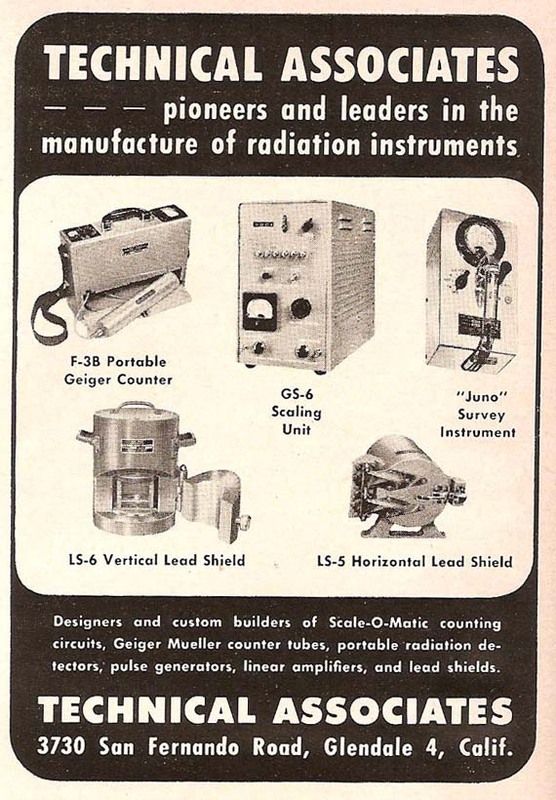 The company advertised “Instrumentation for Nuclear Research” and as products “Engineered by Pioneer Manufacturers of Radiation Instruments”. 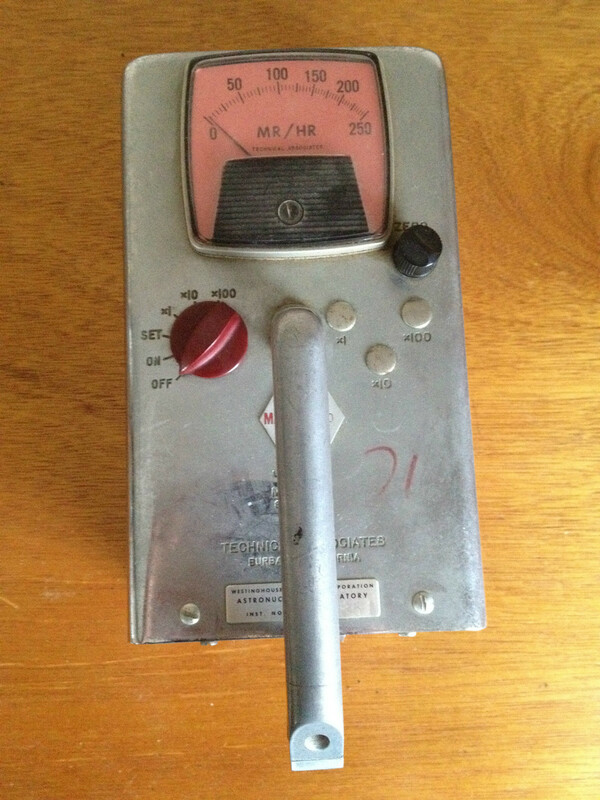 The Model AM-1 was a portable alpha air ionization rate meter introduced in 1948. It was 12” x 7” x 6” and weighed 15 lbs. The sensitivity was to 1000 dpm. It used 1.5, 7.5, 22.5 and 45 volt batteries. The chamber is graphite-coated brass. The two chambers supplied with the unit were a 2.5” diameter x 1.375” and 1.6” diameter x 1.375”. 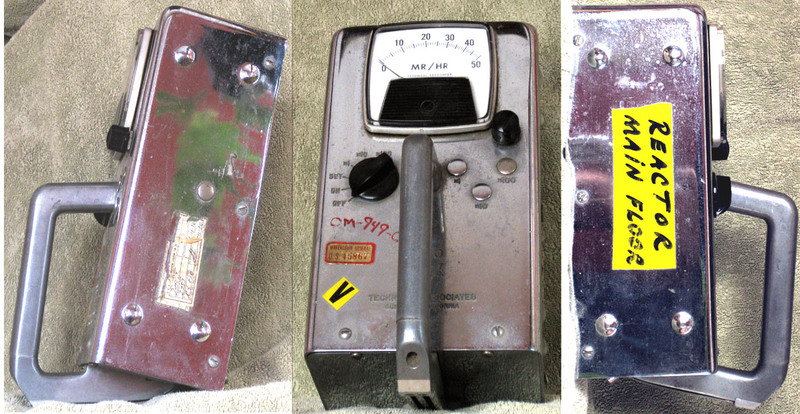 The Model GM-2 was a portable gamma ionization rate meter introduced in 1949. It was 12” x 7” x 6” and weighed 25 lbs. The full-scale sensitivity was 0.5 mR/h. It used 1.5, 7.5, 22.5 and 45 volt batteries. The ionization chamber was 3” diameter x 8.5”, was made of brass and filled with Freon 12 gas to 50 lbs. 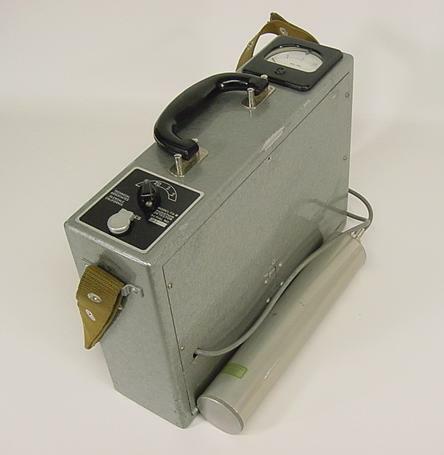 The Model F-3 was designed for use in prospecting for radioactive materials, particularly carnotite and uranium. 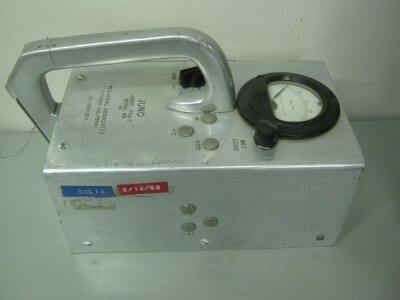 It is also used for checking radiation in laboratories and hospitals and locating lost radium. It has sturdy construction. It has three 300 volt batteries. The Model F-3 was introduced in 1948 for detecting relative intensities of beta, gamma, cosmic, and x-rays. Two sensitivity ranges are provided – low range with full scale of 0.5 mR/h and high range with full scale of 15 mR/h. 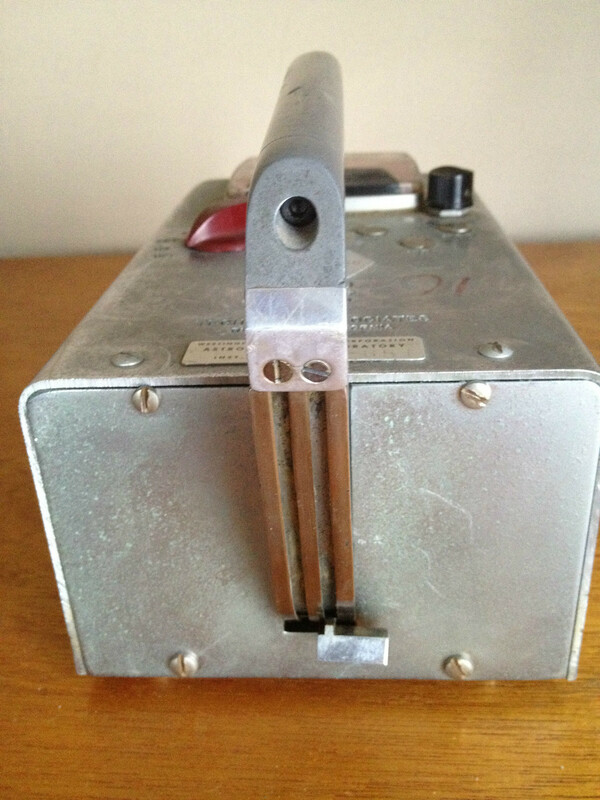 The Geiger tube is attached by a probe which is carried in a compartment in the lower section of the case. The probe has a rotating concentric cylinder shield for beta discrimination. The case measures 13" long x 10.5" high and 3.5" wide. The price was $250 in 1950 as advertised in Grieger's catalog. The Model F-3B was offered in 1950 as an upgraded version of the Model F-3. 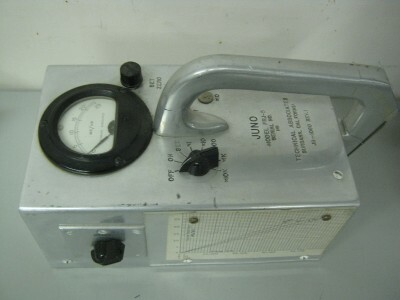 It was a portable GM tube count rate meter for beta and gamma. It measured 13” x 3.5” x 9.5” and weighed 10 lbs. The sensitivity ranges are 0.2, 2 and 20 mR/h. The probe has a rotating concentric cylinder shield for betas. It uses one 1.5V, two 45V and three 300 volt batteries. 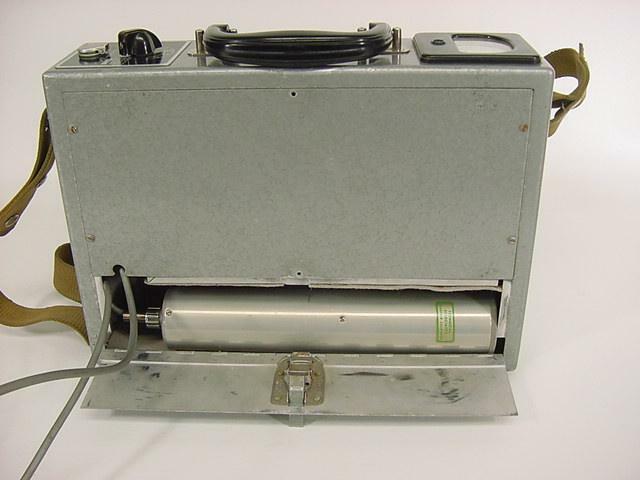 The Model F-4 was a field portable gamma survey meter introduced in 1949. 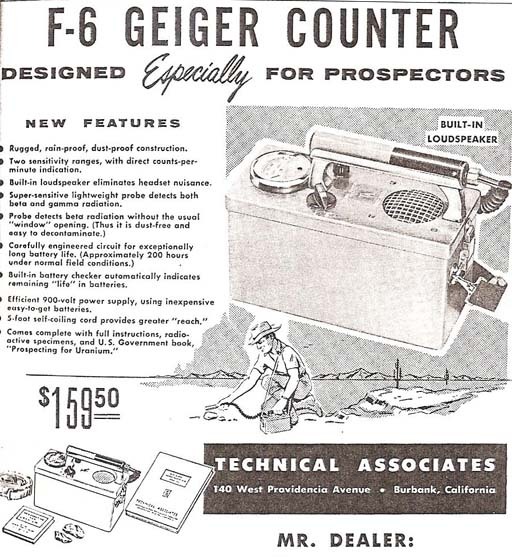 It was a light, reliable Geiger counter designed especially for prospectors. It provide clear sharp clicks in the earphones to reveal the presence of radioactive materials. It was designed for detecting radioactive ores and outcropping for uranium prospecting. It is housed in a steel case for ruggedness and was compact, dustproof and guaranteed to give a long, trouble-free service. It measured 8.75” x 5-7/8” x 2-7/8” and weighs 5 lbs. It was simple to operate with a single turn on switch. 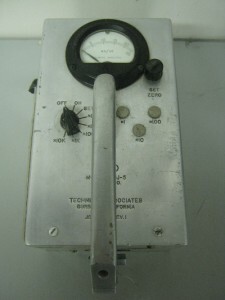 The Geiger counter is located in a external probe. The radiation indication was with audio headphones only. It sold for $125 in 1950 as advertised in Grieger's catalog. The Model F-6 was introduced in 1955. 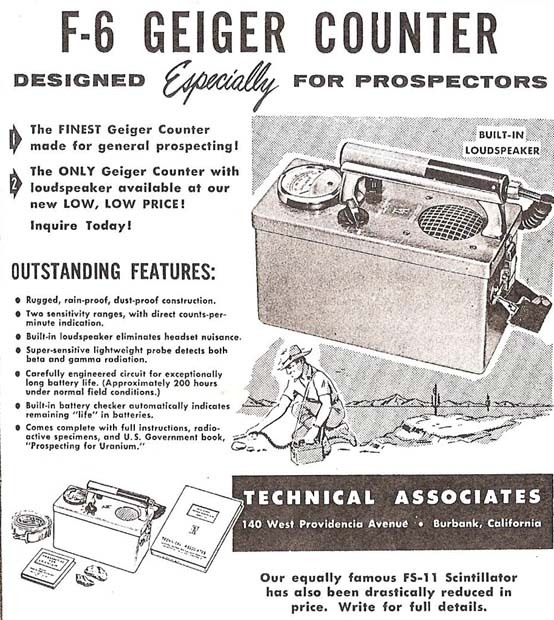 It was a portable Geiger counter with an external probe. It had a large meter and built-in loudspeaker for aural indications. The probe detects both beta and gamma. Probe detects beta without the usual window opening and thus is dust free and easy to decontaminate. It was sensitive from 500-5,000 cpm. It weighted 7.5 lbs. It operates on 900 volts. It has a 5’ self-coiling cord for greater reach. It sold for $159.50. The Juno was first developed by the Atomic Energy Commission (AEC) Hanford Engineering Works around 1947. In 1951, it was manufactured for the AEC by Espey Manufacturing Company, Technical Associates, and Berkeley Scientific Company. 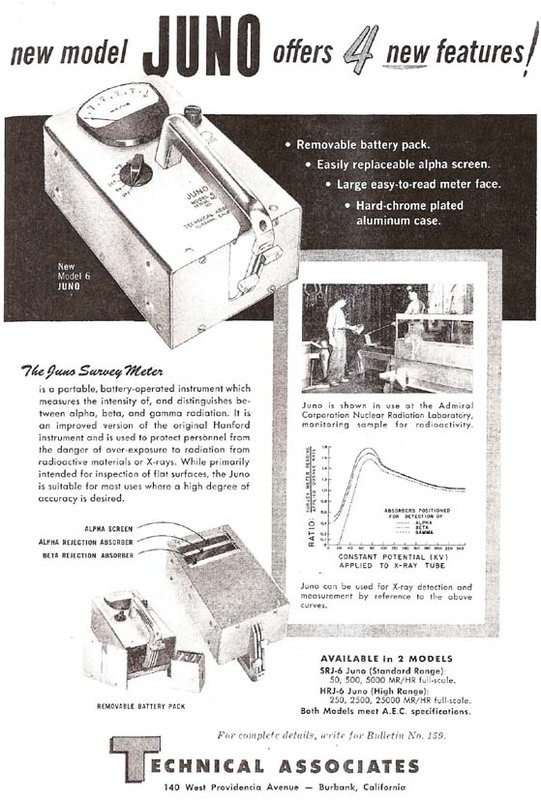 It was designed as a replacement for the Zeus survey meter developed at the Metallurgical Lab at the University of Chicago. 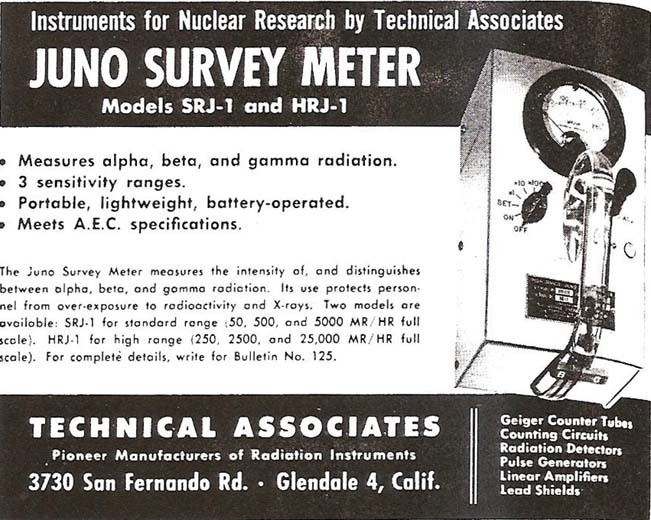 The commercial “Juno” survey meter SR series was introduced in 1950. The Juno survey meter measures alpha, beta and gamma radiation and has filters for alpha and beta rejection. The filters could be inserted via slides labeled B (beta) and G (gamma) on the end of the clear plastic handle. It is a portable, lightweight unit that meets the AEC specifications. Two models are offered, the SRJ-1 (Standard Range Juno) with range 50, 500 and 5000 mR/h and the HRJ-1 (High Range Juno) with 250, 2500 and 25,000 mR/h. The original unit was 9.25” long x 6.5” high and 5.5” wide and weighed 5.25 lbs. 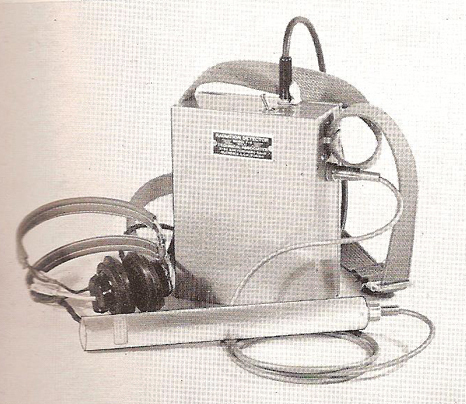 The Technical Associates Model SRJ-1 was 9” x 5.5” x 3-3/4” and weighed 4 lbs. 8 oz. It was also sold in 1955 as the Espey Model H-4-602. The ionization chamber is an unsealed, box-shaped air chamber that has metal walls except for an extremely thin rubber sheet across the bottom face. A wire, bent in the shape of a rectangle, and mounted in the center of the chamber, functions as the anode. The electrode voltage is 90 volts. A heavy aluminum beta shield is mounted in the outer position. Behind this is a cellulose film in a metal frame. The cellulose film and metal frame move independently back and forth across the face of the chamber by two metal tabs that slide along grooves in the handle. The improved Juno Model 3 was introduced in 1953 and came in the SRJ-3 and HRJ-3 versions. 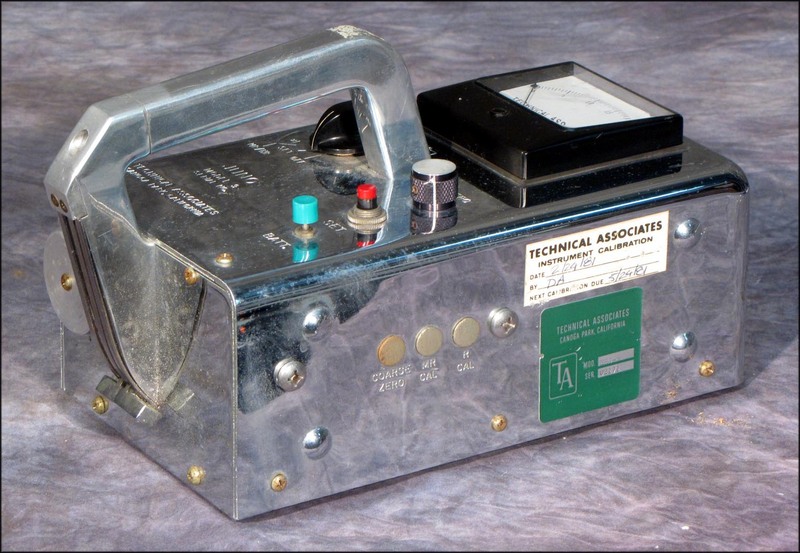 It was a portable, lightweight battery-operated instrument which measured the intensity and could distinguish between alpha, beta and gamma. The chamber was 27 cubic inches. The window opening was 3” x 4-5/8”. The alpha screen was rubber hydrochloride, the alpha rejecter screen was cellulose acetate and the beta rejection screen was aluminum. The new design eliminated many joints and pockets, providing for easy decontamination. Handle is specially cast and highly polished for minimum porosity. The SRJ-3 (standard range) was 50, 500, and 5,000 mR/h. The HRJ-3 (high range) was 250, 2,500 and 25,000 mR/h. It used two 1.3, four 22.5, one 1.5, and two 6 volt batteries. The unit was 9.5” x 5-3/4” x 4” and weighed 6 lbs. 11 oz. The Juno Model SRJ-3 (standard range) and HRJ-3 (high range) were introduced in 1957. The ranges were SRJ-3 (50, 500, and 5,000 mR/h) and HRJ-3 (250, 2500, and 25,000 mR/h). The unit is specially designed to be easily decontaminated with minimum number of joints and pockets. It is made of highly polished cast aluminum for low porosity. The Juno was developed for the Hanford Works, used on the U.S. Nautilus submarine, and other areas of industry. The unit has a lever on the handle to move the alpha screen, alpha rejection screen and beta rejection screen. 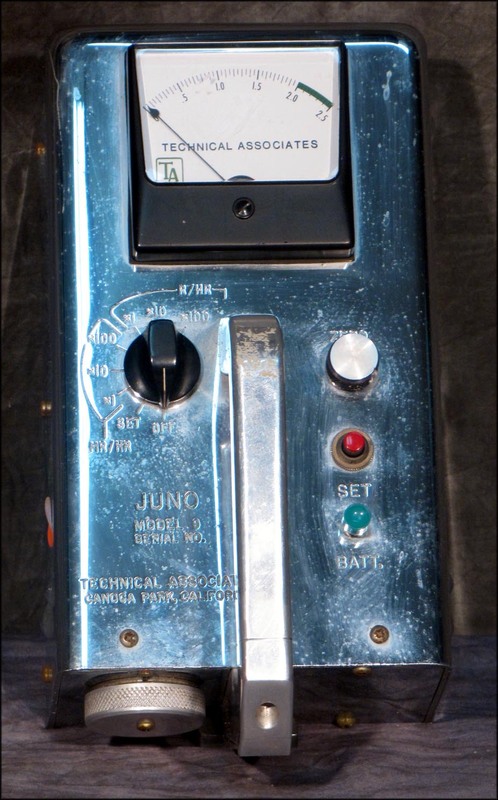 The Juno Model 6 was designed in 1957. The unit offered a removable battery pack, easily replaceable alpha screen, large meter, and hard-chrome plated aluminum case. The handle was aluminum with specially cast low-porosity and smooth polishing. It was a portable instrument that measures the intensity and distinguishes among alpha, beta and gamma radiation. It came in two models, the SRJ-6 (standard range) 50, 500, and 5,000 mR/h and the HRJ-6 (high range) 250, 2500, and 25,000 mR/h. On the bottom side of the unit there was a window with an alpha rejection absorber and a window with a beta rejection absorber. The Juno Model is an ionization chamber used to detect and measure alpha, beta and gamma radiation. The unit is 9.5” x 5.75” x 4” and weighed 6 lbs. 11 oz. 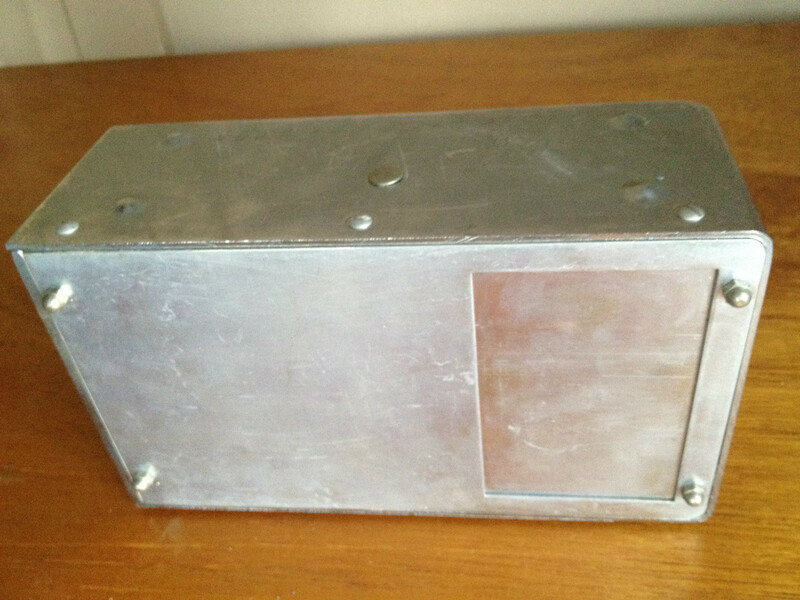 The chamber was 27 cubic inches with a window 3” x 4-5/8”. The bottom of the instrument has a window made of rubber hydrochloride 0.7 mg/cm3 thick. This window allows the detection of alpha radiation. The window can be covered by a beta window (alpha shield) or a beta shield for only detection of gammas. The Samson Model S-12 was introduced in 1957 and was designed for low level alpha detection. 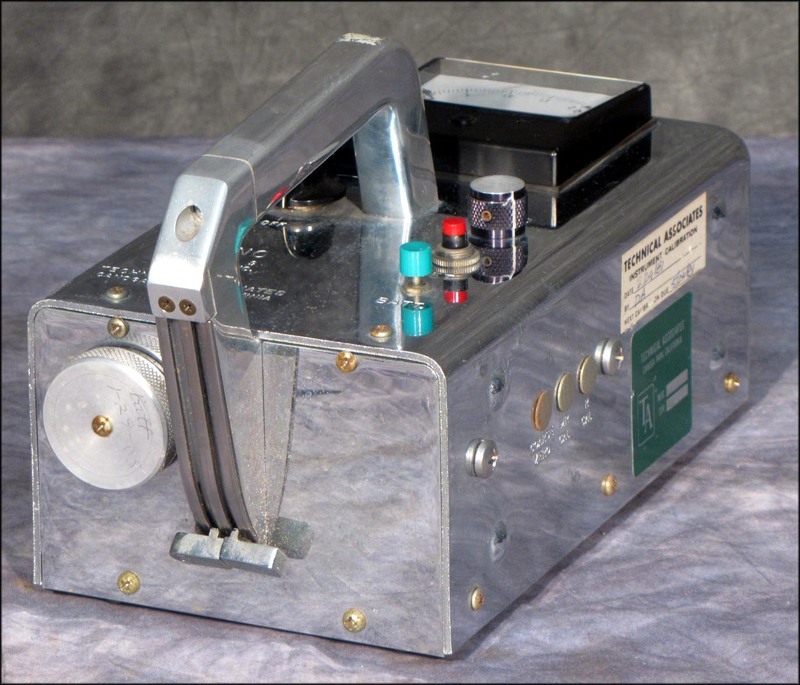 It was a portable, battery operated unit which is directly calibrated in dpm for uranium alpha particles. It can also detect low level beta and gamma radiation. It has three scales from X1, X5 and X25. A military version of the Juno was introduced in the 1950's. It was the Radiacmeter IM-156/PD. It could measure alpha, beta and gamma using a variety of insertable screens. 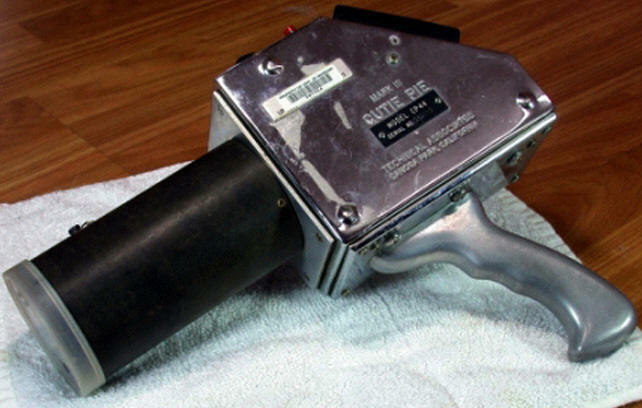 The Model CP-2 “Cutie Pie” (Hanford Model) was introduced in 1952 as an air ionization chamber for use in probing beta and gamma radiation. The end of the chamber was covered with a thin acetate film covered by a removable beta shield. It was easy to decontaminate with a highly polished, formed and welded aluminum case with a mirror polish and low porosity handle. The chamber was 3.5” diameter x 6” long and composed on a paper base phenolic tubing with aquadag inside. It used two 7.5, four 22.5 and one 1.3 volt batteries. It was moisture proof with a one-piece gasketed case. The unit was 12” x 3” x 8” and weighed 4 lbs 12 oz. 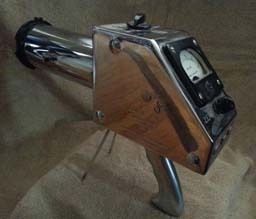 It had a 3.25” easy to read meter with sensitivity range was 50, 500 and 5,000 mR/h. The Technical Associates offered the new Cutie Pie Model CP-3 in 1952. It had three models the CP-3 with ranges 25, 250 and 2,500 mR/h, the CP-3A with ranges 50, 500 and 5,000 mR/h and the CP-3B with ranges 100, 1000 and 10,000 mR/h. The unit used one D-cell and four hearing aid batteries. The unit was 10” x 3” x 8” and weighed 2.5 lbs. The Model CP-3A (Oak Ridge Model) was offered in 1952. 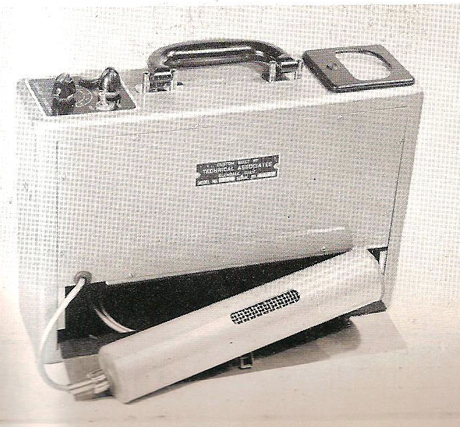 It was a portable beta-gamma survey meter with an ionization chamber. It was also sensitive to alphas. The full scale readings were 100, 1000 and 10,00 mR/h. It used the standard 3” diameter x 6” long ionization chamber. It used four 22.5V and one 1.3 volt batteries. It was 10” x 3” x 8” and weighed 2.75 lbs. The unit was upgraded in 1960 and was alpha sensitive with built in alpha and beta absorption filters. The absorbers can swing into place in front of the unit nose as required. The range selection is X1, X10 and X100. There are also B1, B2, and B3, switch selections to check all batteries prior to use. The unit is equipped with tripod feet for table or floor monitoring. The scale measures from 50, 500, and 5,000 mR/h and useful in health physics work. A new battery give over 800 hours of operation. The Cutie Pie Model 2209 had ranges from X1, X10, X100 and X1000 and correlated to 0-50 mR.